LEXIE CANNES STATE OF TRANS — in 2007, a Los Angeles trans woman visiting Iowa found herself arrested for “trespassing” after using a courthouse’s women’s bathroom. 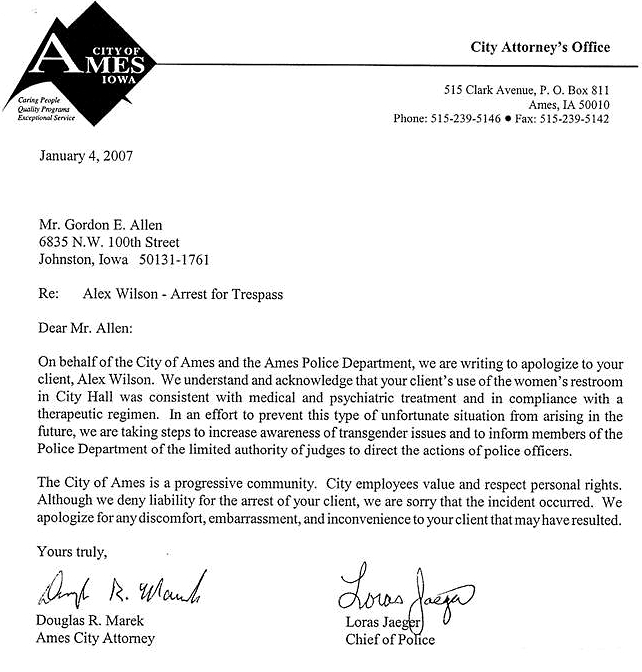 The hiring of an attorney resulted in Alexandra Distance Everheart Wilson getting a letter of apology from the city of Ames, Iowa, and the city’s police chief. In addition, a small financial settlement. But it did not end there for Wilson. She took the letter and hitchhiked to the Iowa State Capital and met with Representative Beth Wessel-Kroeschell and told her that there should be a law in place to prevent trans discrimination. By happenstance, Wessel-Kroeschell said she was was working on a transgender protection bill to be presented in the legislature the next day. Wilson gave Wessel-Kroeschell a copy of the Ames apology to use at the next day’s presentation along with the other data complied by Wessel-Kroeschell and her colleagues. Later in the year, Iowa became 1 of the 10 states in 2007 with transgender anti-discrimination laws. This year the legislators in Iowa are considering beefing up trans protections. Wilson’s suggestions to improve conditions include educating students about transgender people in schools and provide single payer healthcare to reduce costs to trans people to make it less of an emotional challenge for them. An uphill quest for trans right that began a decade ago for Wilson, seemingly remains so with the surfacing more people hell bent on making our lives miserable. The additional emotional costs to trans people of this is startling to show in some more-than-subtle ways. What a nice ending for her after her arrest. In addition I’m glad that the state representative has taken responsibility to push for protection laws. The interesting thing for me as an intersex person are the proposed laws to limit the use of chemicals that effect the endocrine system of the body. These chemicals greatly effected my fetal development, causing my right testis to remain and develop as a fetal ovary ovary. My other testis did remain a testis but never matured to normal adult size. In addition that ovary became malignant when I was an adult, very nearly taking my life in the process. If that were not enough germ cells that failed to reach my fetal ovaries were lodged along the midline of my body. These germ cells were living structures composed of fetal tissue. These ranged in size from 10-14.5 cm. the net effect of all this is gender dysphoria and the pronounced feeling of being pregnant. Ask a phycologist and they with say I’m transgender, ask an medical doctor and the will say I have a Disorder of Sexual Development or intersex. I say I’m both and would apply this to every transgender person. Clearly my brain was programed as female just as were my gonads. With transsexuals it centers around brain development. I wouldn’t wish what I’ve gone though on anyone. Having said that, I cannot imagine being anything but what I am. One more thing. Believe it or not I married and we managed to have two children. It took a very long time to do it but we managed. My broken body and dysphoria made it very difficult but it happened. Over the last few years I’ve spoken out about this because intersex isn’t a rare thing. We comprise about 1.7% of live births. Now that our world is being inandated with EDC endocrine disrupter chemicals I see it becoming more of and issue in the future. My guess best guess it also contributes to transgender brain development. Thank you for letting us know we can win.